A City of London Police Intellectual Property Crime Unit (PIPCU) operation has led to the arrest of three people who are suspected to have orchestrated the distribution and transmission of thousands of illegally modified TV set-top boxes to people worldwide. Detectives from PIPCU executed a series of dawn raids today, 10 August, at a business and three residential addresses in Chorley, Lancashire. Three men ages 36, 40, 58 have been arrested on suspicion of conspiracy to defraud and money laundering offences. They are currently in custody pending further investigation. 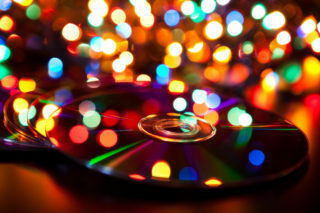 The operation was supported by colleagues from Lancashire Constabulary and the Federation Against Copyright Theft (FACT). So far officers have recovered approximately over 30 servers and set-top boxes which are believed to have been modified with illegal software to enable them access to hundreds of paid for subscription only channels. Some of the channels available on the devices include pay-per-view sports, the latest movies and UK broadcast television only available to UK licence fee payers. Officers have also identified 15 satellites. The PIPCU investigation established that illegally modified devices were widely available to buy on the internet. Enquires then showed that the devices were being marketed as genuine and legitimate for use anywhere in the world, for a yearly fee of around £400. The PIPCU led enquiry now continues with support from licensing experts and broadcasters across the globe. Director General of the Federation Against Copyright Theft (FACT), Kieron Sharp, said: “Illegally modified set-top boxes, along with infringing apps and add-ons, have created new opportunities for criminality and piracy. Tackling these threats and the people behind them is one of our highest priorities and therefore today’s multi-agency action is another great result for law enforcement and the creative industries. A man has been sentenced to 10 months imprisonment for selling illegal TV devices and for re-offending, since being prosecuted and sentenced for the same crime in October 2016. 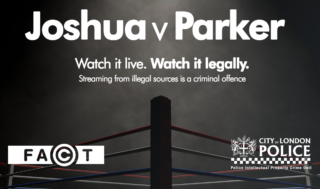 One of the UK’s leading intellectual property (IP) protection organisations has joined forces with the national police unit which leads the response to tackling IP crime to warn users of the risks of illegal streaming ahead of Saturday’s fight between Anthony Joshua and Joseph Parker. A Staffordshire man who was jailed for 16 months for selling fake DVDs on eBay, has since been ordered to pay back more than half a million pounds. A successful joint investigation by FACT and Staffordshire Trading Standards discovered Foster was buying counterfeit DVDs from China and selling as genuine products on eBay to customers across the world. He was sentenced to 16 months imprisonment in January 2016.